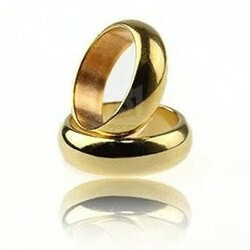 This Gold 21mm PK Ring is shaped like a regular wedding band. Curved surface and can be worn continuously. Thats the beauty of these PK Rings, looks completely normal but its secret magnetic power is always available. Presented in a lovely jewellery box. Coin vanishes and appearances, coin thru can, glass bottle penetration, plastic bottle penetration, matchbox penetration, psychic matchbox, stopping time, haunted deck, deck penetration, coin transpo, psychic coins, coin balance, chopless chop cup, the haunted tom, beer mat penetration.